Dalmation print shorts: Topshop. Black and white checked shirt: Primark. 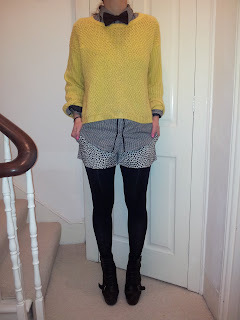 Yellow jumper: New Look. Black bow tie: Stolen from my husbands bow tie drawer. Black platform boots: Topshop. Labels: Bow tie, Dalmation print, platform boots.